It’s difficult to eat and sleep outdoors, but you don’t have to compromise comfort. There are a few things you can try to make your campsite feel more like your real home, especially if you’re staying for a few days or even a couple of weeks. When setting up camp, where you choose to pitch your tent greatly influences your comfort. Choose a dry, flat surface that’s at least 200 feet away from any body of water. This will allow you to avoid mosquitoes and other creatures that wander around to drink water. Set up camp under a tree – the leaves can help block wind or unexpected rainfall as well as the smoke and the sound of nearby campers. It is going to be your home for a while, so don’t be afraid to make it your own and add a small amount of personal touch. If you do pitch your tent near or beneath a tree, put up some battery-operated string lights in the branches. Not only will it look real nice, but will also add some much-needed lighting in your site. You can also decide to bring a lightweight rug or floor mat from house to add extra comfort when you are barefoot in the tent. An inflatable camping bed is far more comfortable to most people compared to sleeping bags, especially to new campers. Bring your favourite thick blanket, a wonderful fluffy pillow and some extra sheets to make you sleep soundly in the outside so much simpler. The possibilities are endless once you’re in the great outdoors – you can go hiking, fishing, exploring and a lot more. All of these are fun but tiring. 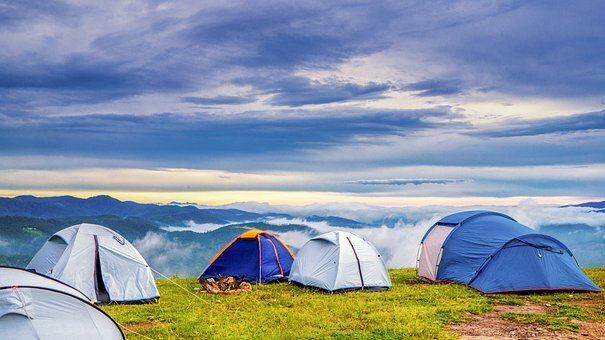 When you’re in a camping excursion, you don’t need to perform these tasks all at once. It is important that you find time to relax and enjoy nature in a different way. Find time to enjoy a warm drink and read a good book, or just sing and tell stories around the campfire with other campers. When you feel secure and comfortable in an entirely different environment like the outdoors, that is when you begin to have fun! Being out in nature doesn’t mean you can’t be cozy so try these easy ways to create your campsite more comfortable!